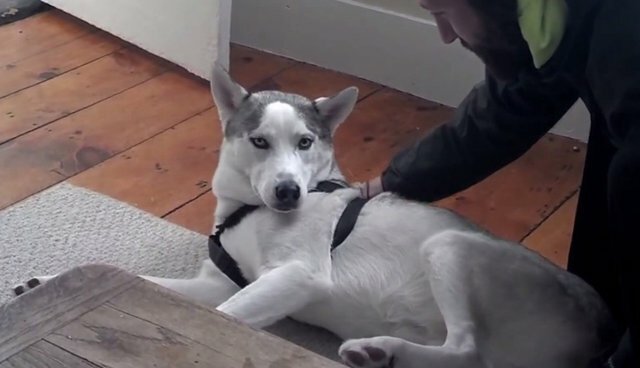 Lazy Husky Refuses To Get Up, Tells Owner "No"
This 11-month old husky, named Blaze, is comfortable on the floor and in no mood to get up -- and he's not afraid of letting his owner know just what he thinks of the idea. YouTube user John Ventresco says that he was merely teasing Blaze into thinking that it was ''kennel time,'' to which the dog responds by going limp and protesting with a sweetly defiant whining-howl that, as the video notes, sounds remarkably like the word "no." While science has yet to decode all the nuances of canine vocalizations, new research suggests that humans are actually quite skilled at interpreting their audible cues as relating particular emotions. Interestingly, other studies have found that dogs possess the same ability when they hear vocalizations from humans -- even if sometimes, like Blaze, they refuse to listen.